…Are they just fantasies of man which contribute to the making of good stories and movies or do they really exist in the spiritual realm? Back in the late nineties or maybe around the first years of the new millennium we saw angels everywhere. People wore angel pins and necklaces (I still have a few in my own collection of costume jewelry). There were pictures of angels. There were statues of angels in flower gardens, parks and cemeteries. They were and still are most often pictured as female in gender with long blond or white hair, wearing a white flowing gown or robe. Most often they are shown with wings. They may be displayed as powerful and majestic or pictured as small children. 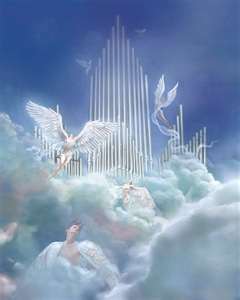 The ideas for many of these pictures come from the descriptions of visions of angels spoken of in the Bible. The Bible however never describes or refers to any angel as being childlike in nature. The “child” angel is a completely human idea. Angels are indeed real. They are spiritual beings who were created by God at some point during the creation of the world. They were created to serve God by protecting those who love Him, but they are also assigned many other duties which they carry out perfectly and with joy. The only true source of information regarding angels comes from God’s Word. God doesn’t tell us exactly at what point He created the angels, but He refers to them in His dialog with Job in chapter 38 of that same book. He says to Job; 4.where were you when I laid the earth’s foundation…6.On what were its footings set, or who laid its cornerstone 7.while the morning stars sang together and all the angels shouted for joy? We can clearly see from this, God’s statement to Job, that they were present as He worked. So what are angels and what do we know about them? God answers many of our questions about angels in His Word. Come with me and let’s talk about it.